Mike Bell, president of The Autism Project of Southern Ohio, presented a $1,500 check to Michele King, president of District 11 Challenger Baseball League. 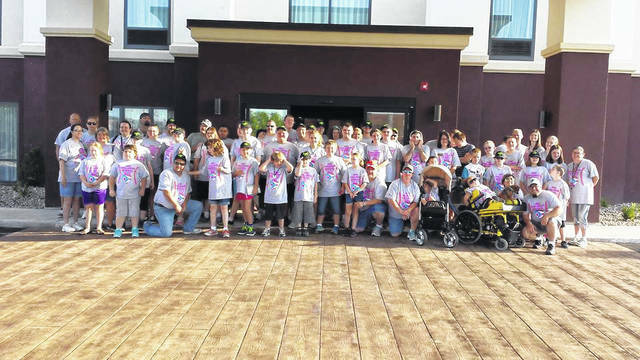 Two of the most special and wonderful groups in Scioto County have come together, as one group helped the other with a goal for local children with physical and/or developmental challenges. The two groups are The Autism Project of Southern Ohio and District 11 Challenger Baseball League. Mike Bell, president of The Autism Project of Southern Ohio. presented a $1,500 check to Michele King, president of District 11 Challenger Baseball League. District 11 Challenger League will be traveling to the annual Ohio Challenger League tournament on July 27-29 in Mason. The Ohio District 11 Challenger Baseball League allows boys and girls facing physical and developmental challenges the opportunity to enjoy the full benefits of Little League in an environment structured to their abilities. The participants have the opportunity to experience the joys of pulling together as a team, being cheered and earning awards for their achievements. They are a non-competitive league — they don’t count outs or runs. Everybody plays, everybody scores, so everybody wins. Children with special needs are given the opportunity to play the great American game of baseball. The Challenger Baseball League also has a fundraiser, a benefit Motorcycle Run on June 23 at Millbrook Park in New Boston, with kickstands up at 11 a.m. This money, too, will be used to raise money for the tournament on July 27-29. The Autism Project of Southern Ohio mission statement is to raise autism awareness, educate the public about autism, support those with autism and aspergers, and help autistic children and adults be the best they can be in school and in the community. The project is a non-profit support group for families and individuals with autism. The group’s Facebook page says it wants to spread awareness and to educate the public about autism. The group was initially created by parents with autistic children, and was formed into a 501(c)(3) in 2007. They are governed by a board of directors and officers. Officers are Michael Bell, president; Kimberly Copas, vice president; Michele King, treasurer; and Brandi Mayberry, secretary. If a business or individual would like to make a donation to the Challenger league, they can make a check payable to District 11 Challenger League, and mail to P.O. Box 888, Portsmouth 45662. The people in our community who donate their time for others unable to do for themselves displays what true caring and giving to others really means. High five The Challenger League and The Autism Project. https://www.portsmouth-dailytimes.com/wp-content/uploads/sites/28/2018/06/web1_Challenger-League.jpgMike Bell, president of The Autism Project of Southern Ohio, presented a $1,500 check to Michele King, president of District 11 Challenger Baseball League.